They jet to St Barts every year over the festive period. 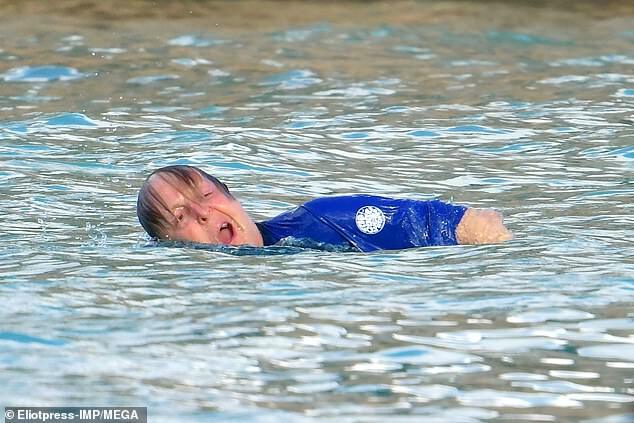 And Nancy Shevell, 59, looked in her element as she enjoyed a dip in the sea with her husband Paul McCartney, 76, on Monday. The brunette beauty made for a striking figure as she hit the beach, showcasing her sensational figure in a plunging swimsuit. Nancy Shevell stayed stylish whilst taking a dip in the ocean thanks to her red leopard print one-piece! It is, of course, by Stella McCartney. Does anyone in this family wear anything else?! And why on earth should they when they have pieces by such a coveted label at their fingertips. We love the red tones of this costume that makes a refreshing change from traditional animal print hues. Plus, the one piece design is oh so chic! The great news is it’s still available to buy, so click right now to make it yours. Saving up for a holiday in the sun instead? Get the look for less with the doppelganger designs we’ve picked out for you below. Nancy looked half her 59 years as she donned a black and scarlet printed swimsuit that accentuated her incredible physique. A low-cut neckline offered a peek at her perky assets, whilst the high cut leg showed off her pert posterior and lean legs. Her natural beauty was on display as she went make-up free, whilst her glossy brunette locks were wet and slicked back away from her face. 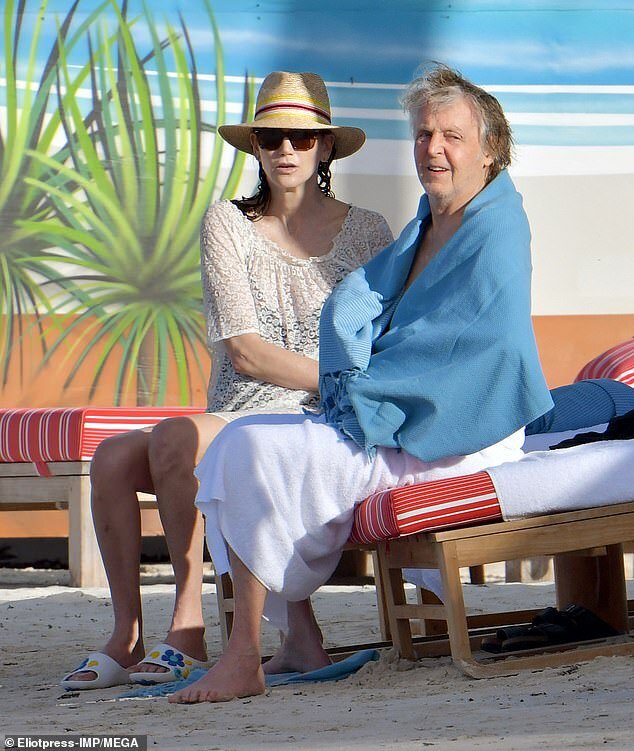 Beatles legend Paul kept covered up for the outing, donning a navy shirt with blue ombre design swimming trunks. 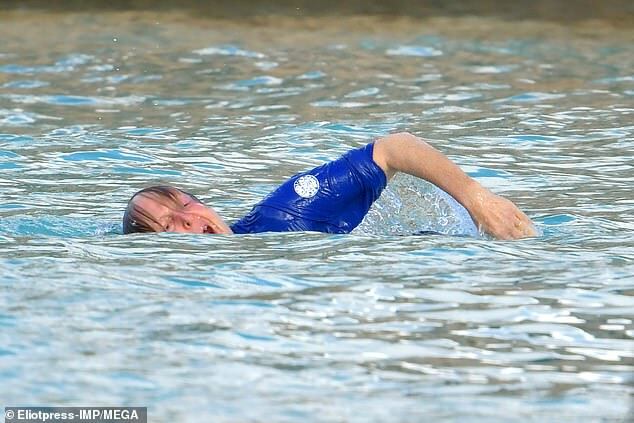 The couple looked smitten with one another, with Paul playfully lifting up Nancy and scooping her into his arms for a cuddle in the shallows. They later left the sea hand in hand before settling in for some quality time whilst tanning on the sunloungers. 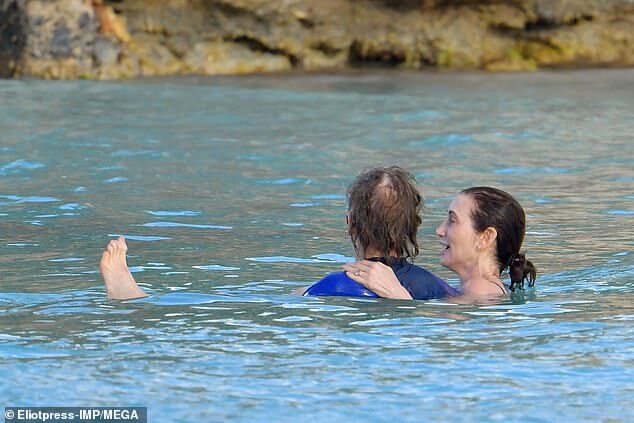 The couple head to St Barts every winter, and earlier in the week had been joined by Paul’s designer daughter, Stella. Sir Paul was married previously to photographer and musician Linda McCartney from 1969 to her tragic death from breast cancer in 1998, aged 56. His second marriage to former model Heather Mills lasted just six-years before their split in 2008. He went onto tie the knot for a third time with New Yorker Nancy, with whom he has been happily married since 2011. Every year the couple enjoy taking a trip to the glorious St Barts over the festive season for some winter sun in the red hot Caribbean. Paul shared his positive thoughts and hopes for the year ahead with his Twitter followers when he wished them all the best. He tweeted: ‘I hope everyone has a really brilliant New Year, with all the fab things they’ve hoped for coming true. Meanwhile, Paul recently revealed that he often reforms the Beatles in his dreams, as he admitted sadness over the loss of bandmates John Lennon and George Harrison. Talking to BBC Radio Scotland, the star said: ‘John and George are still a big part of my life, always will be. ‘It would have been great to get the Beatles back together again. People always say what if? But we can’t, so, sadly, that’s not going to happen. ‘I often think about them with a lot of sadness, because they should still be here. In John’s case, it was a terrible thing. In George’s, a terrible illness. He continued: ‘As a musician, you often have dreams about being in the studio or on stage, so I’m often with the guys. ‘Just the other morning, I woke up and I was with George. And that was very nice. I think of George as my little mate – he was the youngest in the group. John was killed by Mark David Chapman after he shot him outside his Manhattan apartment on December 8, 1980. He was sentenced to 20 years to life in the Wende Correctional Facility in New York. George passed away on November 29, 2001, after a battle with lung cancer. Ringo Starr, 78, reunited with Paul earlier this month on stage at London’s O2 arena during the final night of the UK leg of Macca’s Freshen Up tour. They were also joined by Rolling Stones rocker Ronnie Wood, 71.